Turquoise Gold Ring are beautiful and unusual. In general Turquoise has been associated with Sterling Silver in the United States in the past with little set in Gold, however, Turquoise set in Gold is and has been standard in most othe places on earth. 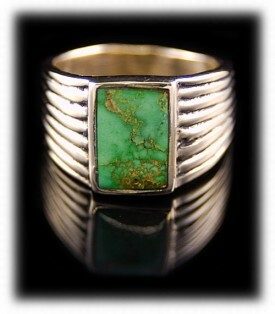 Durango Silver Company has been making Turquoise and Gold Rings for many years. 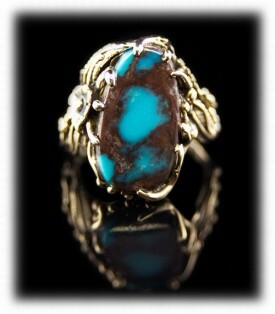 We even use Colorado Gold Nuggets in some of our Turquoise Gold Ring. 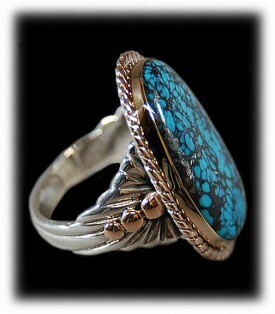 Durango Silver Company also makes a lot of Turquoise Gold Ring on special order. We often show our customers special Turquoise Stones to choose from and then pinpoint a particular design for their Turquoise and Gold Ring. We specialize in Mens Rings in Gold and make many of them. We make substancial Mens Gold Rings that make a statement and we also make Mens Rings in Gold and Silver which are unique, look great when worn and are substancially less costly then solid Turquoise Gold Ring. If you would like a Turquiose Gold Ring, check out the Gold and Turquoise Ring page in our site by pushing the Gold Jewelry Button on the left side bar. You can get a good idea of some of the Turquoise Gold Rings styles we make and if you wish to see more you can contact us. 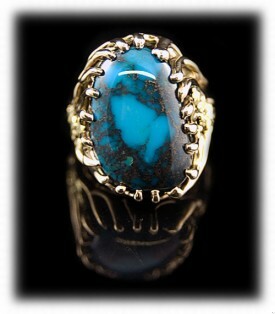 Turquoise Gold Ring are special and a good choice in a Gold Ring for a man or a woman. The color of gold is outstanding with blue or Green Turquoise. A Blue Turquoise Mens Gold Ring as the ring on the left is beautiful and is very attractive on a mans hand. When you want to look really classy you may love to have a Turquoise Ring such as this. This particular ring features the rarest and highest grade of Natural Dry Creek Turquoise from the Godber or Burnham mine in Nevada. The Green Turquoise Gold Mens Ring on the right is a sleek style with a Inlaid stone that sits low to make an easy to wear ring for a man. This ring features an outrageous lime green Turquoise stone from the Orvil Jack mine in Nevada, USA. The Turquoise Gold Ring on the left is a Womans Gold Ring made in the Lost Wax method by John Hartman. 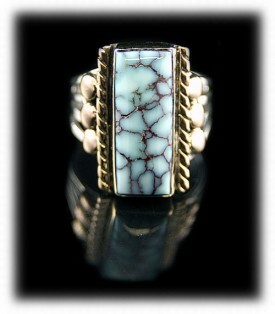 It is a stunning Turquoise and Gold Ring with beautiful Bisbee Blue Turquoise from Arizona. The Mens Rings Gold on the right is a Gold and Silver Turquoise Ring and has a very large Spiderweb Blue Wind Nevada Turquoise Stone. Turquoise Gold Ring like this make a big statement and are fun to wear, we enjoy making spectacular Gold Turquoise Rings that are dynamic and both of these two Turquoise Gold Ring are that! The ring on the left is an outstanding Bisbee Turquoise Gold Ring. It was made in the Lost Wax method by John Hartman of Durango Silver Company in Durango, Colorado USA. 14kt Gold with Colorado Gold Nuggets surrounding the beautiful Bisbee Turquoise Gemstone is a ring that is truely a collectors item and absolutely a one of a kind that will never be repeated. Rings of this caliber can be made to fit any lifestyle and desire. The ring on the right is a lostwax mens gold ring by Nattarika Hartman. This Lime Green Tortoise Turquoise gold ring made using the lost wax technique. John Hartman came later and inlaid the natural 24kt Natural Colorado Gold Nuggets into the ring. 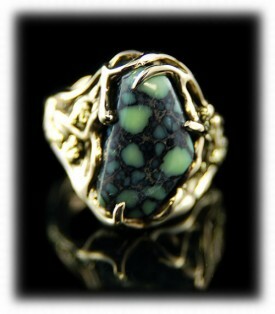 This gold mens Turquoise ring features a top gem grade spider web Tortoise Turquoise cabochon. If you would like to see more quality Turquoise Gold Jewelry and other designs as they become available. We invite you to join our other members in joining our occaisional Newsletter. Occaisionally, we send out a Newsletter with news about Durango Silver Company, Southwestern Jewelry produced by our company and the latest news from Durango. We also have a monthly drawing and give away a piece of Jewelry from Durango Silver Co to one of our friends that have subscribed to our Newsletter.